1 VIB-KU Leuven Center for Microbiology, Kasteelpark Arenberg 31, B-3001 Leuven, Belgium. 2 Laboratory of Molecular Cell Biology, Institute of Botany and Microbiology, KU Leuven, Kasteelpark Arenberg 31, B-3001 Leuven, Belgium. Keywords: Pep4, Prb1, cathepsin D, protease, programmed cell death, SAGA, prion, Saccharomyces cerevisiae. In the model yeast S. cerevisiae, vacuolar proteases are known for the mass degradation of excess and senescent long-lived proteins, to preserve protein homeostasis. Generally, proteins destined for turnover reach the vacuole through the process of endocytosis or autophagocytosis . The substrate range of vacuolar proteases is wide and rather non-specific, assuring that the bulk of proteins gets degraded and constituents can be reused. So far, seven vacuolar proteases have been characterized in S. cerevisiae. They consist of two endoproteases called proteinase A and proteinase B encoded by PEP4 and PRB1, two carboxypeptidases Y and S encoded by the genes PRC1 and CPS1, two aminopeptidases I and Y encoded by APE1 and APE3 and a dipeptidylaminopeptidase encoded by DAP2. The group of Brodsky has reported on an eighth vacuolar protease encoded by PFF1, although its protease activity still needs to be demonstrated experimentally . The cytosolic proteasome represents another main site of protein breakdown in the cell, presumed to degrade specific short-lived and damaged proteins. Next to the degradative action of Pep4 and Prb1, the proteases also have a specific function inside the vacuole. With the exclusion of Dap2, all vacuolar proteases are synthesized as precursor proteins that become proteolytically activated and matured by the action of Pep4 and Prb1. This includes the precursors of Pep4 and Prb1 themselves. Pep4 stands at the top of this proteolytic activation cascade, as in pep4 mutants the precursors of vacuolar proteases accumulate with little biochemical activity . Upon activation by Pep4, Prb1 is more often involved in the proteolytic processing of the precursor proteins, although Pep4 has redundant activity. A detailed review on the complex proteolytic activation cascade and transport routes of the vacuolar proteases can be found in  and references therein. Recently, studies on Pep4 and Prb1 activity also suggest non-vacuolar, specific substrates with diverse functions. In all these studies, the effect of the proteases was claimed to be autophagy-independent, often suggesting a non-vacuolar localization for Pep4 and Prb1. This is summarized in Figure 1. FIGURE 1: Predicted locations of the Saccharomyces cerevisiae pro-teases Pep4 and Prb1. Both proteases are well known for their role in protein degradation in the vacuole. Pep4 and Prb1 share a prominent role in the proteolytic activation and maturation of most vacuolar proteases, including themselves. Under stress conditions, the permeability of the vacuolar membrane has been reported to increase. This might enable the proteases to escape the vacuole and locate to other sites in the cell (indicated by arrows). It has been reported that Pep4 is associated with mitochondrial degradation under acetic acid-induced apoptosis. Furthermore, it has been described that nucleoporins are degraded by Pep4 in H2O2-induced cell death, sug-gesting a nucleus-associated localization. This idea is strengthened by the importance of Pep4 in the generation of the SAGA-like (SLIK) complex by cleavage of the Spt7 component of the SAGA complex. It was found that the conserved pro-cess of H3 clipping, altering gene expression, was performed by the Prb1 protease in S. cerevisiae, also sug-gesting a nuclear localization for Prb1. Furthermore, Prb1 was shown to inhibit [PSI+] prion formation. Okamoto et al. hypothesize that prevention of prion formation by cleav-age of the Sup35 protein takes place on actively translating ribosomes. It should be noted that the non-vacuolar localiza-tions of Pep4 and Prb1 were never confirmed in vivo by conclusive experimental results. Pep4 shares 46% homology with human cathepsin D (CatD), a lysosomal protease . Similar to the human homolog, it has been reported that yeast Pep4 can be released from the vacuole under different kinds of stress, although the physiological relevance is unsure. Various studies propose that non-vacuolar Pep4 might play a role in stress-induced apoptosis. As such, Pep4 is responsible for the degradation of nucleoporins after H2O2 stress, an apoptotic process that is executed by caspases in mammalian cells . However, the functional significance of this action is unclear as in S. cerevisiae the degradation presumably takes place after the cells have lost their viability. 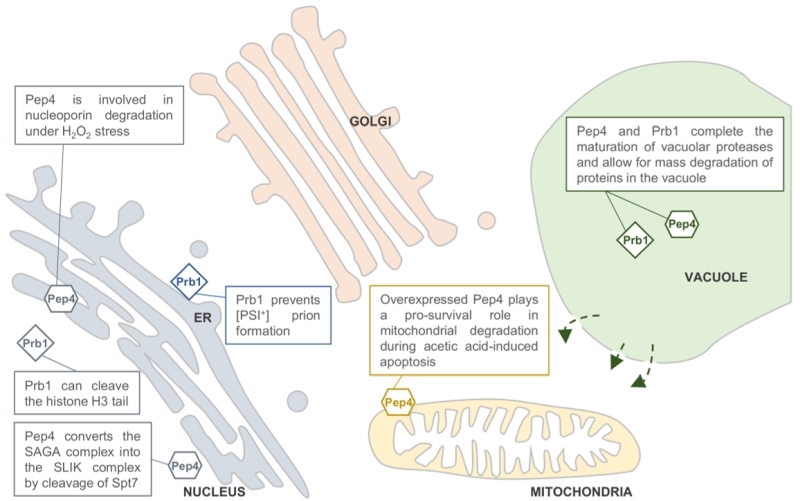 Another study has indicated that Pep4 is released from the vacuole under acetic acid stress and plays a pro-survival role in mitochondrial degradation during acetic acid-induced apoptosis . A follow-up study confirmed that the protective role of Pep4 is dependent on its catalytic activity . According to Carmona-Gutierrez et al. , Pep4 carries anti-apoptotic and anti-necrotic activity during chronological aging. The anti-apoptotic activity depends on Pep4’s catalytic activity, while the anti-necrotic activity resides within the Pep4 precursor protein and is independent of its catalytic activity. It was shown that Pep4 overexpression resulted in a pro-survival effect during aging-induced cell death, that was caused by the anti-necrotic function only. This effect was accompanied by reduced histone H3 acetylation and dependent on increased spermidine biosynthesis. The interplay of histone acetylation levels and polyamine metabolism has been demonstrated by other labs as well, but the underlying molecular circuitry and the relevance to survival remain largely unidentified . A pro-survival signal of Pep4 was not detected under oxidative stress. Although overexpression of PEP4 led to increased removal of oxidized proteins, it did not enhance lifespan . Altogether, these results show that vacuolar proteases affect programmed cell death in a stress-dependent manner. These relatively recent findings in yeast and the homology to mammalian processes opens perspectives for the clarification of the underlying molecular pathways. Ideally, this might lead to the identification of new drug targets, as various human diseases are caused by apoptosis-based mechanisms . SAGA (Spt-Ada-Gcn5 acetyltransferase) is a multi-subunit histone modifying complex that is conserved from yeast to mammals and is known for its role in regulating gene expression . Interestingly, Pep4 can transform the SAGA complex into the SALSA or SAGA-like (SLIK) complex, by cleavage of the Spt7 component, leading to loss of its Spt8-binding domain . The function of SLIK has not been identified so far, but the authors report on an increased resistance to rapamycin when SLIK is present. Rapamycin is the inhibitor of the TORC1 complex, which regulates growth in response to nutrients and cellular stresses, suggesting a role for SLIK in the response to nutrient starvation . It could be argued that Pep4 can thus influence gene expression both in a stimulatory and an inhibitory manner. Opposite to the gene inactivating histone hypoacetylation that accompanies Pep4 overexpression , generation of the SLIK complex links Pep4 with histone acetylation activity and thus gene activation. As the SAGA and SLIK complexes share at least thirteen subunits, some functional overlap between both is expected. Indeed, it has been demonstrated that the SLIK complex is capable of histone acetylation, similar to the SAGA complex . It might be that the functional difference between both complexes can be ascribed to a difference in the set of genes that become activated by their histone acetyltransferase (HAT) activity. This could be dependent on the properties of the unique components that make up the SAGA or SLIK complexes. Although the conversion of SAGA into SLIK might also alter the affinity to histone acetylation, which was not documented to our knowledge, it is more likely that Pep4 steers gene expression towards the induction of a certain subset of genes, by formation of the SLIK complex. As such, it could be hypothesized that the contrasting effects on histone acetylation associated with Pep4 converge on the activation of specific subsets of genes, while others are repressed. Histone modifications are a common form of epigenetic regulation. The N-terminal cleavage of histone H3 is also a conserved process from yeast to mammals, but the biological significance is often unknown. The timing of cleavage depends on the specific cell type. In S. cerevisiae, it was found that Prb1 possesses histone H3 cleavage activity in vitro and that endogenous activity is absent in a prb1Δ deletion mutant . Previously, histone H3 clipping had already been associated with stationary phase and sporulation, consistent with the activity pattern of Prb1 and further confirming the H3 clipping activity of the protease . Histone cleavage by Prb1 can be considered a posttranslational modification that affects gene expression. It is hypothesized to either clip off transcription inhibitory marks at the histone tail or mark those nucleosomes that are to be displaced, to allow induction of gene expression . How Prb1 might localize to the nucleus was not addressed, however based on sequence analysis, the authors suggest that Prb1 contains a nuclear localization signal . No additional data regarding function or localization can be obtained from the closest human orthologue of Prb1, which is proprotein convertase subtilisin/kexin type 9 or PCSK9 . This protease is extensively studied because of its function in cholesterol metabolism but there does not seem to be any overlap in function with the yeast Prb1 protease. Recently, it was observed that Pep4 can provide cytoprotection from human α-synuclein (αSyn), in a yeast model for Parkinson’s disease. Overexpression of αSyn led to cytosolic acidification and cell death, which could be overcome by overexpression of Pep4. Moreover, overexpression decreased αSyn oligomers and aggregates. For this, Pep4 required functional calcineurin, but the molecular framework needs further elucidation . Similarly, it was shown that overexpression of CatD protects against αSyn toxicity in mammalian cells and in the nematode C. elegans . It is remarkable that in C. elegans not only CatD overexpression but also spermidine supplementation rescue αSyn-induced pathology, albeit presumably in an autophagy-dependent manner . It is unclear whether CatD overexpression and spermidine supplementation converge on a similar response to αSyn toxicity as was demonstrated with aging-induced cell death in yeast, where the anti-necrotic effect of overexpressed Pep4 depended on spermidine biosynthesis . Prions are infectious transmissible proteins that are self-propagating, turning healthy proteins into their prion isoforms. They cause diseases like mad cow disease in cattle and Creutzfeldt-Jakob disease in humans. In S. cerevisiae, multiple prions have been described . [PSI+] is the prion form of Sup35, also known as translation termination factor eRF3. The [PSI+] prion leads to repression of many stress-response genes . Interestingly, it was found that Prb1 can inhibit de novo [PSI+] prion formation by cleaving off a region of Sup35 N-terminally, which is crucial for the initial formation of aggregates . However, the protease cannot degrade existing [PSI+] prions. In all, this suggests that Prb1 can protect a cell from de novo [PSI+] prion formation. In this way it can enhance the general stress response of the cell. Although prions usually form amyloid structures, Roberts and Wickner  propose to consider any protein that can modulate itself in trans and be transmitted from one individual to another as a prion, without the need for amyloid formation or loss of function. Following this hypothesis, they demonstrated that active Prb1 is a prion, referred to as [β] that changes the conformation of its own precursor protein to mature Prb1. Although the study of vacuolar proteases in pathogenic fungi is only beginning to develop, some studies already link their action to the pathogenicity of the species. For example, in the phytopathogenic species Ustilago maydis, the pep4 gene was found to encode a vacuolar protease homologous to ScPep4. Deletion of this gene showed a strong effect on the yeast to mycelium dimorphic transition and reduced the virulence of the strain compared to the wild type strain . Also, in Trichoderma species, which are mycoparasitic fungi that are used as biocontrol agents of phytopathogenic fungi, secreted hydrolytic enzymes such as Prb1 are thought to play a key role in the process of mycoparasitism . The degree of homology between the mycoparasite Prb1 and yeast Prb1 is however unclear. In the human pathogen Candida glabrata, the protease homologs have only recently been identified, based on sequence homology. While their vacuolar localization was confirmed, additional functional studies are currently missing . In the Candida albicans genome database, three genes have been postulated as putative ScPRB1 homologs, while the ScPep4 homolog has been characterized as the CaApr1 protein. Recent studies suggest a role for CaApr1 in morphological transition under nitrogen deficient conditions, and indicate a link between CaAPR1 gene expression levels and the progression of Multiple Sclerosis disease in patients . This may be another example of how our microbiota may affect specific human diseases. In the human pathogen Aspergillus fumigatus, PEP2 was identified as a ScPep4 homolog and ALP2 was annotated as a ScPrb1 homolog . Both proteins were found to be associated with the cell wall. Interestingly, Δalp2 mutants had a severe reduction in conidia formation and a slight growth defect. Moreover, ALP2 was found to be identical to a major allergen of A. fumigatus. These data support the idea that the proteases might be of importance in pathogenesis, and further research can confirm their medical relevance. This idea is reinforced by the recent identification of A. fumigatus PEP2 and ALP2 as potential targets for antifungal vaccines . This short overview illustrates the wide range of processes influenced by Pep4 and Prb1. It is evident that these proteases are not solely vacuolar degraders. Based on the preliminary reports in S. cerevisiae, the proteases seem to take part in a broad stress response mechanism, that is independent of autophagic processes and affects regulatory processes such as gene expression and programmed cell death. The molecular details however remain largely obscure. Further investigation of the non-vacuolar activities of Pep4 and Prb1 should provide the scientific community with an increased understanding of these general stress responses. It seems essential to determine the autophagy-dependency of Pep4 and Prb1 activities in future studies, to bring about a global understanding of the stress responses that are affected by these proteases. Current results in S. cerevisiae lead to the observation that autophagy-related stress responses rely solely on vacuolar Pep4 and Prb1 protease activity, while autophagy-independent actions of Pep4 and Prb1 occur outside of the vacuole. This idea should be validated further. Eventually, profound knowledge of these processes might identify specific participants as interesting new drug targets, both in fungal biology as well as in mammalian pathology. This work was supported by a grant from the Flemish Science Foundation, FWO (project number G.0C15.14). We would like to thank Nico Van-goethem for help with the figure. A Cinderella story: how the vacuolar proteases Pep4 and Prb1 do more than cleaning up the cell’s mass degradation processes by Kerstens and Van Dijck is licensed under a Creative Commons Attribution 4.0 International License.